This blog was written by NCTE member Shelby M. Boehm. Every time I stepped up to the free-throw line during a game, I missed. It was frustrating because free throws are always predictable in basketball; the same player formation, the same distance from the line to the hoop, the same amount of time given to shoot unimpeded. These missed baskets meant driveway hoop practice with my dad. He’d encourage me, critique my form, and remind me to take my time. His coaching was my home court advantage. Without the pressure of a game, I scored nearly every time from the line. I think the pressure I felt at the free-throw line during a game is similar to what my students sometimes experience when I ask them to respond to poetry. The literary devices are predictable, but the way they take shape throughout a poem changes along with their purpose. Although my students have studied tone multiple times, when we approach a new text, there are apprehensive students afraid to take their shot at analysis for fear of missing the point. I realized I needed to give all students access to low-pressure analysis. Instead of giving students a poem and a prompt that seemed daunting, I wanted students to take ownership in an open discussion. The goal of March Poetry Madness is to reinvent the traditional study of poetry. Through this work, students are still analyzing text, but in a way that feels opinion-based and thus casual. These informal conversations give students confidence to dig further into what aspects of the poem cause their preferential responses. 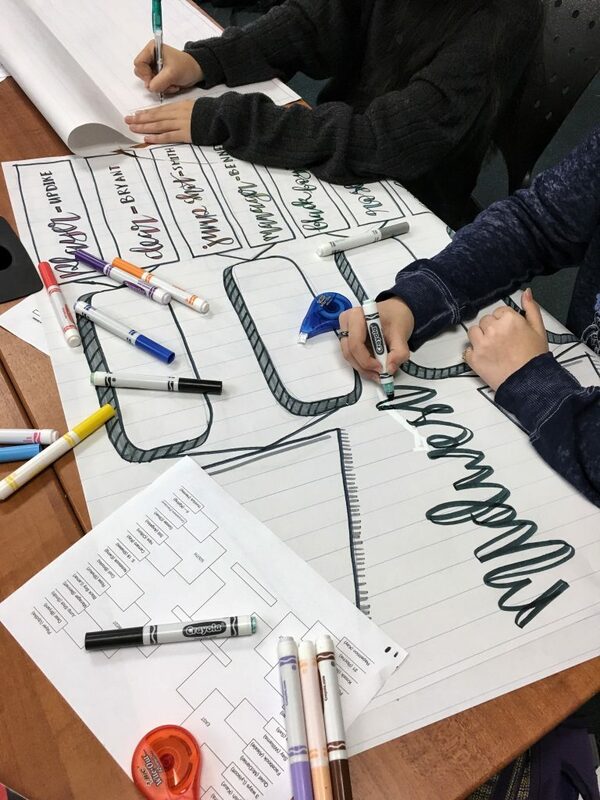 My students, Miranda and Katrina, creating our classroom March Poetry Madness bracket. 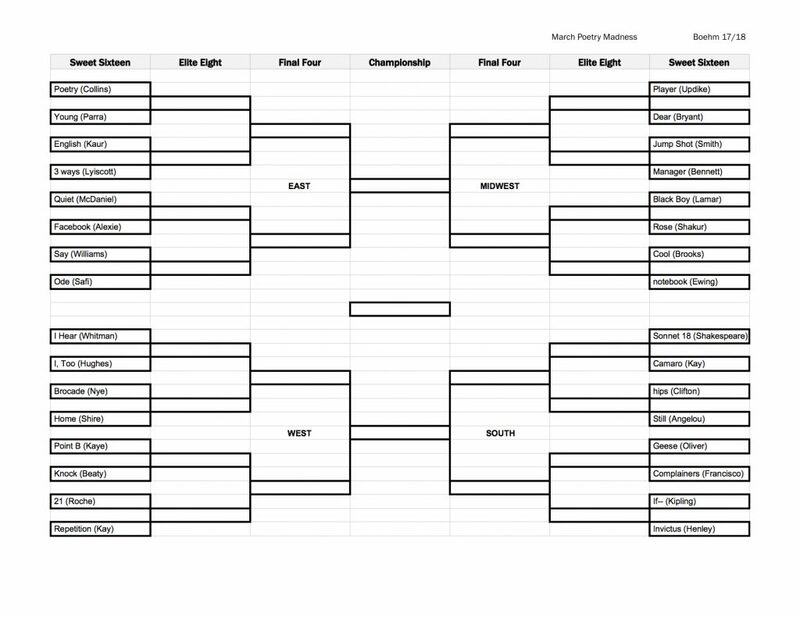 I first saw the idea for March Madness brackets in the classroom on various blogs and teacher-centered social media profiles. Classroom versions included battles between books, poems, characters, and even writing techniques. What topics engage your students? What do your students typically respond well to? Are you currently investigating a topic, theme, or essential question in your classroom? Do your students need exposure to certain literary devices? Or maybe you want to introduce students to the variety and depth within the poetry genre. Traditionally, a March Madness Bracket has 64 starting teams. Because of time constraints, I started my bracket with 32 teams (poems). I was intentional in choosing poems from young authors, authors of color, authors not in the traditional poetry canon, and poems that discussed timely topics. If you’re planning in advance, you could ask your students to help in the selection process. I found Google Spreadsheets to be helpful for this process because I made frequent changes and had a lot of team (poem) stats! I organized my poems using the following categories: Title, Author, Website Link, and Category. I later added in Seed and Conference to replicate a real NCAA March Madness bracket. Again, I used Google Spreadsheets; however, there are many free printable brackets available online. I decided to pair poems that discussed similar or related topics. Decide how to hold the poetry tournament. To name a few options, you could have multiple poem battles in a day or spread them out over weeks, depending on your other course content. I plan to begin class every day of March with a poetry tournament. We’ll have a discussion about the poems focused on our response to each piece, specifically why, where, and how the poem made us feel a certain way. Students will then vote on their favorite piece—the winning poems will continue in the tournament until there is one final champion. There is much to be explored outside of the traditional poetry canon. My hope is that students will see their lives as poetry and themselves as poets as they are exposed to the variety within the genre. The study of poetry can be engaging and accessible for anyone, but teachers need to be intentional in meeting hesitant students at the free-throw line. 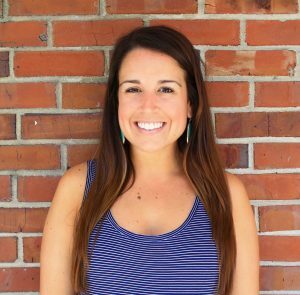 Shelby Boehm teaches tenth-grade English language arts at P.K. Yonge Developmental Research School, the University of Florida’s affiliated K–12 laboratory school. She can be reached at sboehm@pky.ufl.edu or on Twitter @TeamBoehm.